Special Order : This item is out-of-stock, but is typically re-stocked within one week. Celebrate the service of our men and women overseas with Cuban Crafters American Emblems humidors. 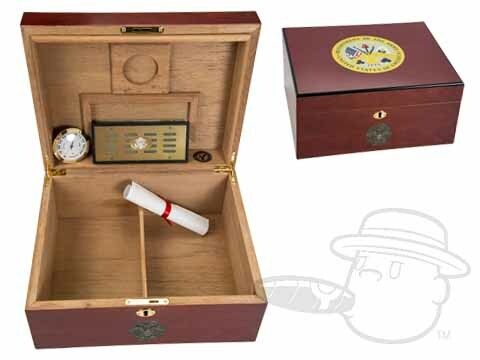 The humidors are adorned with either an Army, Navy, Air Force, or Marines logo, and come with a humidifier, hygrometer, and cedar inserts. Each humidor comes with a 1-year warranty, so you can use these with confidence. A portion of the proceeds from each sale goes to charities throughout the United States. what's the size, (H)X(W)X(D) ? The dimensions of this humidor are approximately 15 inches x 9 3/4 inches x 6 3/8 inches.